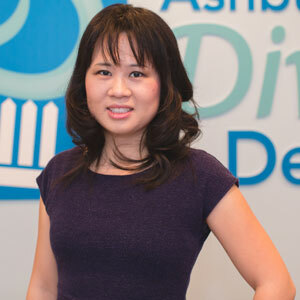 Dr. Lulu Lin is a General Dentist who is raised in Southern California and moved to her husband’s hometown Ashburn, Virginia around Christmas 2011. She speaks English and Mandarin. She graduated from University of California-Los Angeles with Bachelor Science in Biology and from University at Buffalo-School of Dental Medicine in New York with Doctor of Dental Surgery. In Dental School, she received rigorous training in General Dentistry. After graduation, in addition to working at general dental practices, she also worked at pediatric offices where she gained extensive experience in Pediatric Dentistry. She is certified in oral conscious sedation. To stay at the forefront of dentistry, she’s trained in the latest technology Same Day Crown Omnicam (world’s first powder free digital impression) to offer her patients the highest form of Dentistry: Convenience, Comfort, and Precision. She enjoys treating adults and children! She genuinely cares for patient’s dental health and overall well-being that is why she is honest and conservative when treatment planning for her patients. She wants to make her patient’s dental experience as comfortable as possible. She sees Dentistry as a long term relationship and wishes to maintain that between her and her patients. Dr. Lin enjoys spending her free time with her husband Phanith and their sons Gracen and Paxten. Dr. Lin enjoys hiking, going to the beach, traveling, seasonal activities, reading, and watching movies at home. 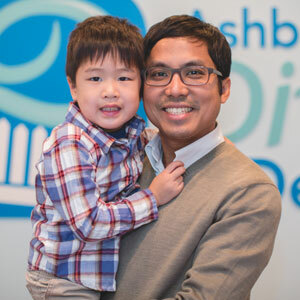 Dr. Phanith Lim is a homegrown Dentist from Sterling, Virginia. He is a compassionate and humorous Dentist whose main priority is the care and well-being of the patient. This led him after Dental School, to further his Dental training in Buffalo, New York. Where he received his Advanced Education in General Dentistry and served for one year as a Clinical Instructor and Restorative Faculty. During his residency, he received extensive training in Cosmetic Dentistry, Root Canal Therapy, and in Implant Dentistry. He is certified in oral conscious sedation, Invisalign, and use of the advanced Cerec technology (inlays, onlays, crown, and bridges in one appointment). His passion for serving the community has led him to complete seven dental mission trips to the Dominican Republic and Mexico and he plans on going on many more in the future. Dr. Lim enjoys spending his free time with his wife Lulu and their sons Gracen and Paxten. He enjoys hiking, reading, playing piano and guitar. Dr. Richard Koh received all of his degrees from the University of Michigan in Ann Arbor, receiving a B.S. in Biology and D.D.S. and M.S. in Periodontics. He is a Diplomate of the American Board of Periodontology (Board-Certified). Dr. Koh is well published in periodontal and implant journals as well as lectured on topics such as implants and periodontal-related topics. He has received numerous awards including, the Academy of Osseointegration Outstanding Dental Student Award (2007), Comprehensive Care Award (2007), and the American Association of Dental Research Fellowship (2005). Dr. Koh is married. In his spare time he enjoys traveling, golfing, reading, and spending time with his family.